I just offered myself a challenge on the first day of Spring. Could I take an “Off the Grid” retreat for 10 days while staying here in New York City? I can report that it is going about 65% well with a positive attitude that this percentage will rise as the days go forward. Habits die hard when you have not changed your surroundings. I am working on choosing new daily activities to open up possibilities for inspiration and creativity in my home city. I am walking new pathways, visiting different neighborhoods, and prioritizing reading and writing to my computer activities. Today, I went to a favorite coffee shop, leaving my iPhone off in my bag. Instead of the company of my to-do list/journal, I brought a new book I have been looking forward to reading – Interaction of Colors by Josef Albers. 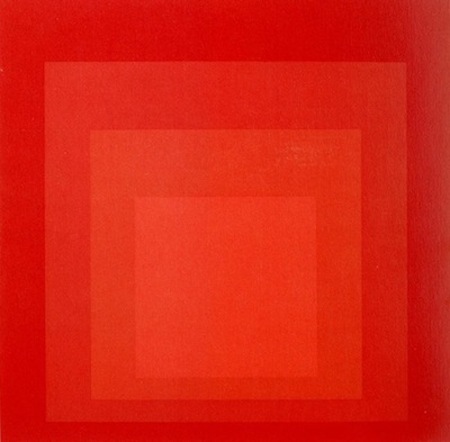 Josef Albers was a German-born American artist and educator. He is famous for creating not only his own body of work as an artist, but also for inspiring other artists through carefully designed educational programs to teach art technique and skills. Experimental yet precise, Albers taught many artists about the theory of shapes, colors, and composition. He was one the famous faculty members of the truly experimental curriculum offered at Black Mountain College. Oh how I wish I had been a student there! His methods were not considered mainstream at the time but today he is revered as a true pioneer in the field. Below is a section of the first chapter of Albers’ Interaction of Colors. I was struck by how it related to teaching, trans-disciplinary thinking, and mind/body studies. My brain was firing “a-ha” moments about the difficulties we can experience in relationships, communication styles, and perceptions…in a single classroom, across an entire city, on this vast planet. It felt important to post his writing here for you. After all, this is MindBodyBrew….writings for the empty cup. but no one can be sure whether each has the same perception. Fill up your cup with that one!